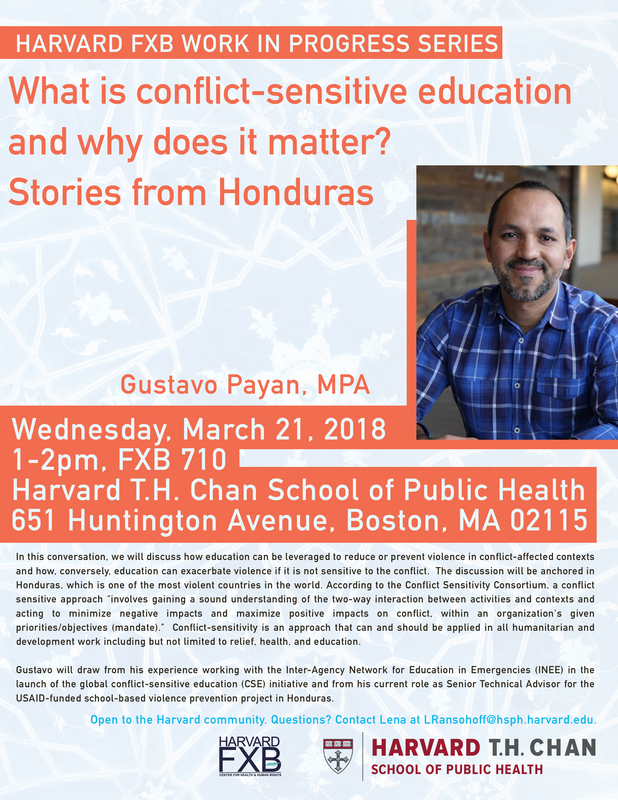 In this conversation, we will discuss how education can be leveraged to reduce or prevent violence in conflict-affected contexts and how, conversely, education can exacerbate violence if it is not sensitive to the conflict. The discussion will be anchored in Honduras, which is one of the most violent countries in the world. According to the Conflict Sensitivity Consortium, a conflict sensitive approach “involves gaining a sound understanding of the two-way interaction between activities and contexts and acting to minimize negative impacts and maximize positive impacts on conflict, within an organization’s given priorities/objectives (mandate).” Conflict-sensitivity is an approach that can and should be applied in all humanitarian and development work including but not limited to relief, health, and education. Gustavo will draw from his experience working with the Inter-Agency Network for Education in Emergencies (INEE) in the launch of the global conflict-sensitive education (CSE) initiative and from his current role as Senior Technical Advisor for the USAID-funded school-based violence prevention project in Honduras.